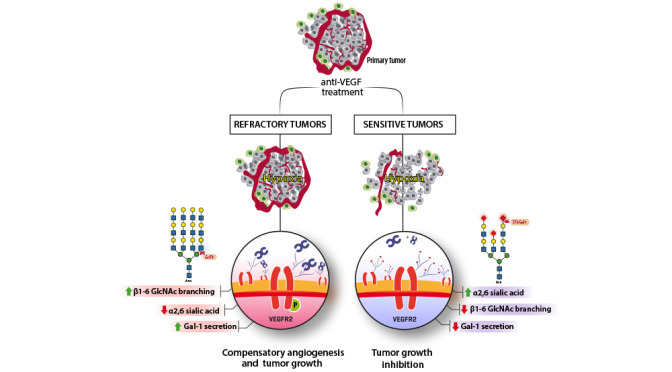 Hypoxia generated by anti-VEGF treatment induces refractory tumors to secrete Gal1 and promotes remodeling of glycans on the EC surface in order to enhance Gal1-binding and VEGFR2 signaling. Hypoxia generated by anti-VEGF treatment induces refractory tumors to secrete Gal1 and promotes remodeling of glycans on the endothelial cell surface which contributes to enhance Gal1-binding and VEGFR2 signaling (left). This activation induces revascularization and promotes tumor progression. In contrast, anti-VEGF sensitive tumors are covered by α2,6-linked sialic acid which prevents Gal1 binding and tumor angiogenesis (right). Croci et al, Glycobiology 2014.